(hī-ā'tŭs), [TA] The plural of this word is hiatus, not hiati. An aperture, opening, or foramen. aortic hiatus the opening in the diaphragm through which the aorta and thoracic duct pass. Inferior view of the diaphragm, showing the openings through which the aorta, esophagus, and vena cava pass. esophageal hiatus the opening in the diaphragm for the passage of the esophagus and the vagus nerves. pleuroperitoneal hiatus foramen of Bochdalek; a posterolateral opening in the fetal diaphragm; its failure to close leaves a congenital posterolateral defect that may become a site for congenital diaphragmatic hernia. saphenous hiatus the depression in the fascia lata bridged by the cribriform fascia and perforated by the great saphenous vein. semilunar hiatus the groove in the ethmoid bone through which the anterior ethmoidal air cells, the maxillary sinus, and sometimes the frontonasal duct drain via the ethmoid infundibulum. 1. A gap or interruption in space, time, or continuity; a break: "We are likely to be disconcerted by ... hiatuses of thought" (Edmund Wilson). a usually normal opening in a membrane or other body structure. hiatal, adj. A gap or abnormal space. pl. hiatus [L.] an aperture, gap, cleft or opening. the opening in the diaphragm through which the aorta and thoracic duct pass. the opening in the diaphragm for the passage of the esophagus and the vagus nerves. the opening in the diaphragm for the passage of the caudal vena cava; properly called foramen venae cavae. 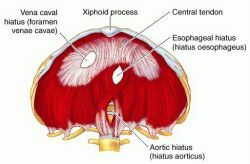 Location of the apex of sacral hiatus in relation to level of sacral vertebra varied from S2 to S5 vertebra level. The Economist, the very influential British journal, is one of the most notable examples of an establishment alarmist organ admitting the hiatus, while still stubbornly clinging to the AGW thesis and trying desperately to account for the "puzzling" lack of predicted warming. The simulations also indicated that the oceanic warming during hiatus periods has a regional signature. Hiatus hernia occurs when the top of the stomach herniates into the chest and its acidic stomach contents flow backwards into the oesophagus (reflux). You must have a strategy for how you will talk about your hiatus with potential employers. If there is a hiatus hernia it may be necessary for you to have surgery. The outrageous waterfowl has been on hiatus since ending his gig following QAF episodes. 2 reopened in May 2004 after a 32-month hiatus due to weak vehicle demand. After a 10-year hiatus, Lou Coppo has rejoined General Pool & Spa Supply of Rancho Cordova, Calif. However, a hiatus in a poem is not necessarily an aural event. After a four-year hiatus, initial public offerings have returned as a boom in exports of commodities pumps up the economy.